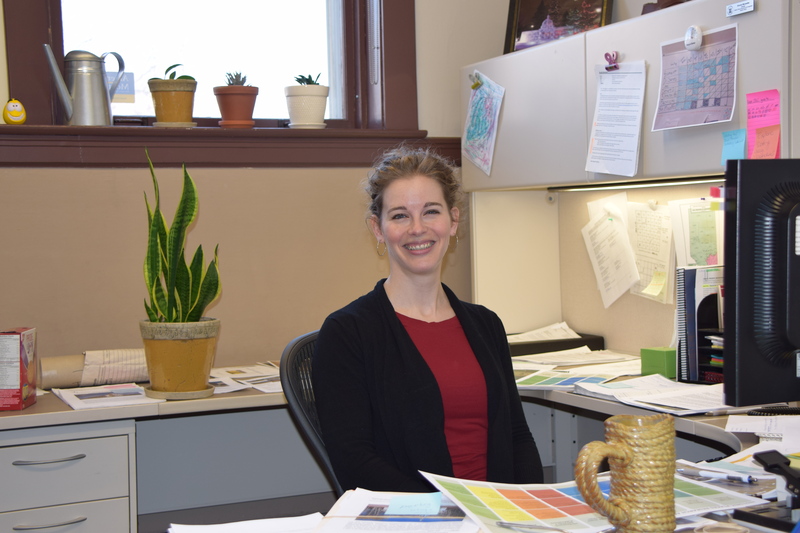 Anna Curtis heads up the Historic Resource Management Branch’s Land Use Planning Section. If proposed development projects in the province could potentially impact historic resources, the Historical Resources Act allows the Minister of Alberta Culture to require the project proponent to perform studies or other work before their projects can proceed. “What we do is coordinate [the regulatory approval process],” Anna explains. 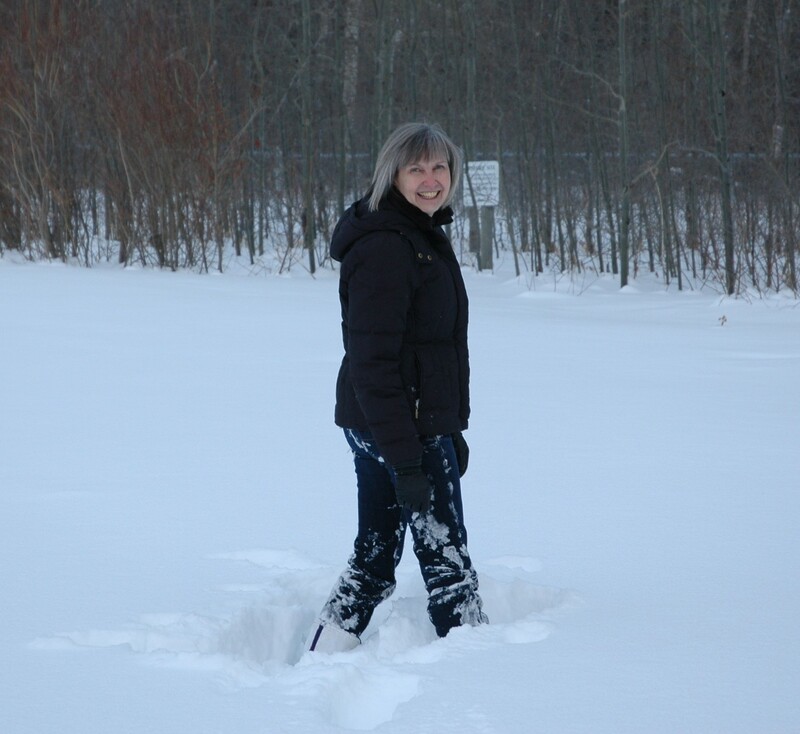 Anna Curtis, Head of Land Use Planning, working at a site in the Cypress Hills. Because Land Use Planning acts as a central coordinator, the different sections of the branch can concentrate on their specialties without needing to worry about presenting a comprehensive requirement for the proponent to follow: Land Use Planning synthesizes the different sections’ points of view. Anna explains, “Managing the project is what we’re all about. We’re the central point. The archaeologists don’t necessarily have to know what the palaeontologists want—that’s our job.” She has been the Head for not quite two years. Previously, she worked at the Royal Tyrrell Museum, doing land use planning in palaeontology. 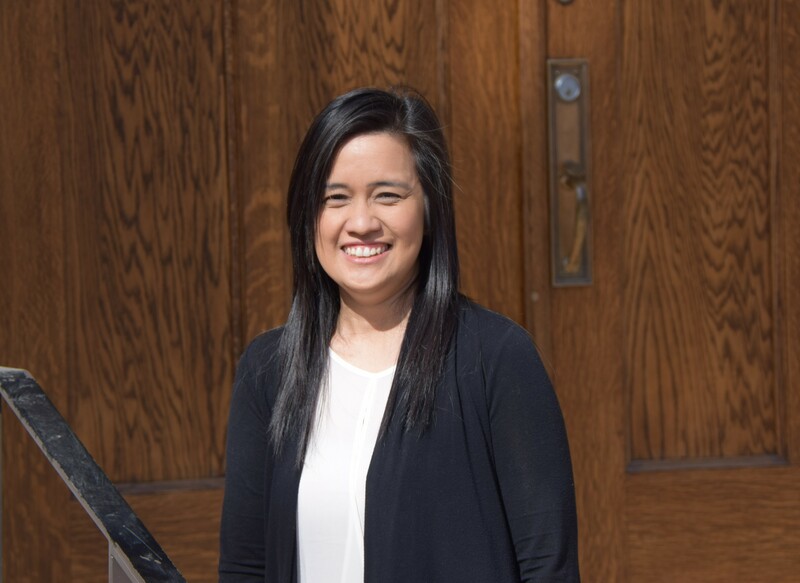 For the last ten years, she worked with the federal government in an Aboriginal relations and consultation capacity. All four areas that Land Use Planning covers (archaeology, palaeontology, Aboriginal traditional use, and historic use [structures]), Anna has covered in her personal background—meaning that she’s well-equipped to head up her section’s mandate to synthesize and communicate the different sections’ requirements. Occasionally, though, a particular historic resource is deemed far too valuable to allow development to impact it. This was the case with the Quarry of the Ancestors, a significant stone-quarrying and tool-making site for pre-contact native peoples, situated in the middle of the oil sands. 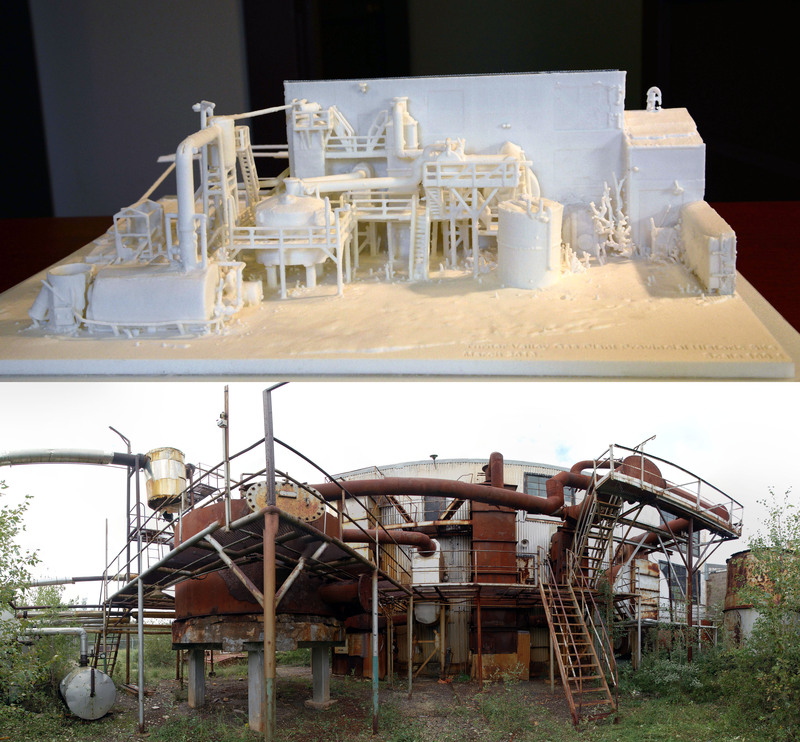 “It’s a big deal when you remove part of an oil sands lease out of production,” Anna notes. But most of the time, rather than putting a halt to development, the Historic Resources Management Branch makes sure that studies are done so that information can be obtained about the site before development that may damage the historic resource is allowed to move forward. With all the development happening in the province, the branch is busy. The Land Use Planning Section helps the branch to stay ahead in several ways. Changing technologies also lead to different types of concerns. For example, open pit mining in the oil sands is now joined by the in situ process—using a series of wells placed in a row that inject steam into the earth and force the oil out of the sand. The impact of these wells on historic resources is wholly different. Larry Pearson, Director of the Historic Places Stewardship Section. As Director of Historic Places Stewardship, Larry Pearson heads one of the three sections that make up the Historic Resources Management Branch. 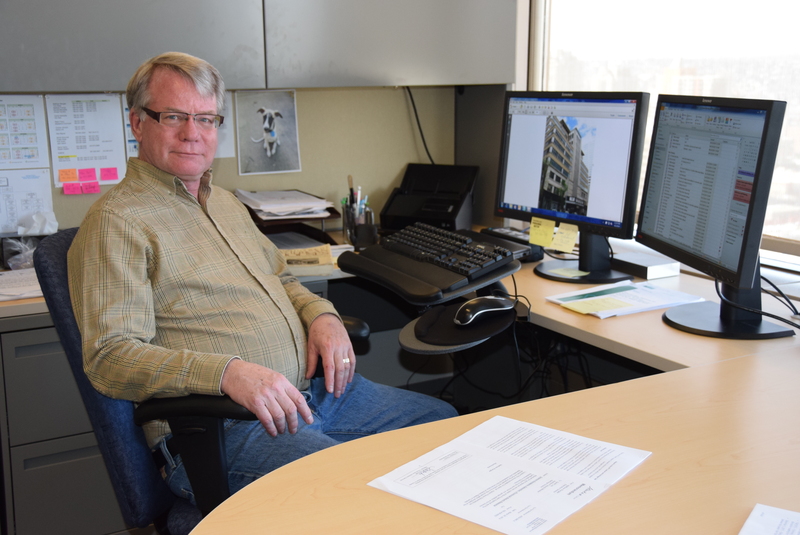 Next October will mark Larry’s 35th anniversary doing heritage conservation work for the Province of Alberta—and he’s seen, and overseen, many changes. 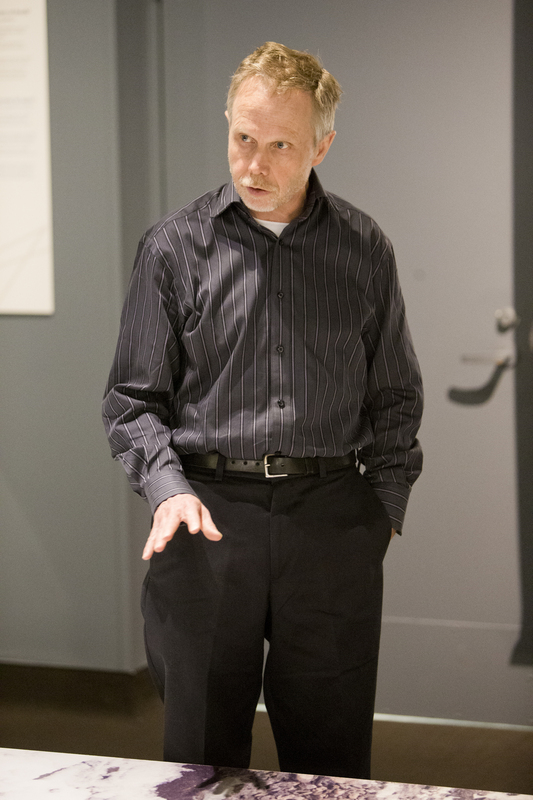 Larry was completing a master’s degree in architecture at the University of Calgary, with a focus on heritage conservation, when he was hired as the Restoration Officer at the Ukrainian Cultural Heritage Village. Within a few years, the Ukrainian Cultural Heritage Village was amalgamated into the provincial Historic Sites Service, and eventually Larry became responsible for overseeing the architectural design work for all provincially owned sites undergoing restoration. 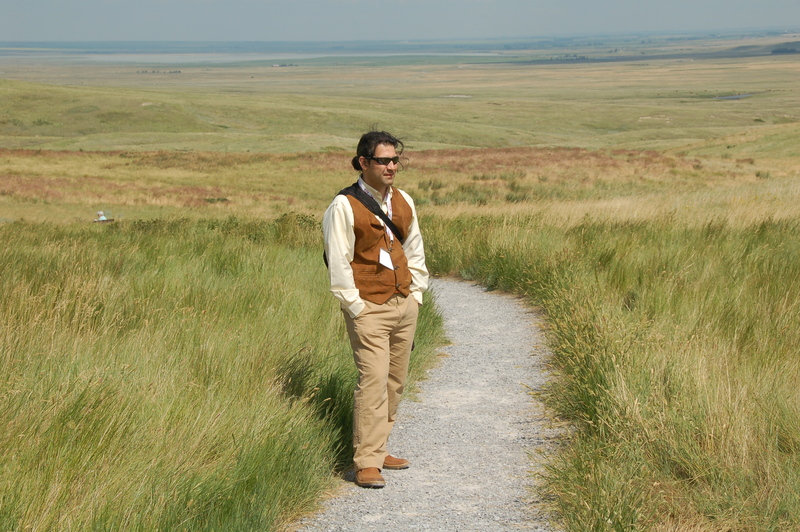 He was the project manager for a three-year effort to develop the Fort George and Buckingham House Provincial Historic Site—location of the first forts along the North Saskatchewan River, dating from 1792—into an interpreted site with a visitor centre and trail system. Later he headed a team, made up of colleagues he’d worked with at the Ukrainian Cultural Heritage Village, that researched and carefully dismantled St. Onuphrius Church Ukrainian Catholic Church. The Canadian Museum of Civilization (now called the Canadian Museum of History) acquired the small Eastern-Rite church to be part of the Canada Hall, its main permanent exhibit. That project won the 1997 Premier’s Award of Excellence as best team project. Larry enjoys the challenge of planning restoration projects: “understanding how a building has changed over time, confirming what it looked like, deciding the appropriate period of significance that we want to return it to, and returning it to that period in a way that has minimal impact on historic fabric.” And he appreciates the value of collaborating (including having impassioned discussions) with colleagues from related disciplines. He continues to encourage that kind of teamwork in his current position. As of 2000, Larry was managing what was then called Community Heritage Services, within the Historic Sites Service. Community Heritage Services was responsible for identifying and designating historic places as Provincial Historic Resources, and ensuring that their ongoing conservation preserved their heritage value, as well as providing assistance to community groups involved in heritage projects—a lot of what the Historic Places Stewardship Section does now. But this was somewhat outside the scope of the rest of the Historic Sites Service, which was focused on the development and operation of provincial historic sites. Meanwhile, other units involved in identifying, protecting, and supporting the conservation of historic resources were located in different branches of the Heritage Division. 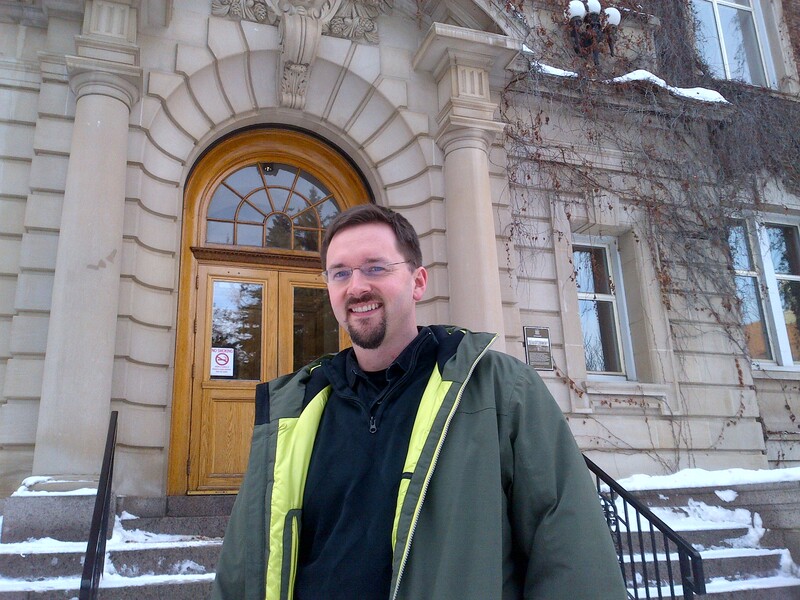 Because heritage resource management functions were diffused across the division, “the philosophical and policy discussions that needed to happen around how to identify, protect, and manage Alberta’s historic places didn’t happen,” Larry recalls. In fall of 2000 he and colleagues from other branches within the Heritage Division were asked “to develop and implement a process that asked and answered the question: ‘Are we structured the best way we can be to accomplish what we’re being asked to accomplish?’” The result was a reorganization that established the current Historic Resources Management Branch in February 2001, gathering together functions that previously had been spread across other branches. Larry was responsible for forming what was then called the Protection and Stewardship Section within this new branch, which he has headed since its beginnings. “The section’s programs are focused on identifying, protecting, and conserving Alberta’s historic resources,” Larry explains. From the start he worked to ensure that “we had an established rulebook, a policy framework, about what we were doing.” His approach to conservation management was informed by his participation on the Association of Preservation Technology’s board of directors from 1984 to 1989, as a member of the training and conference committee, and later as program chair for its 1999 conference held in Banff. 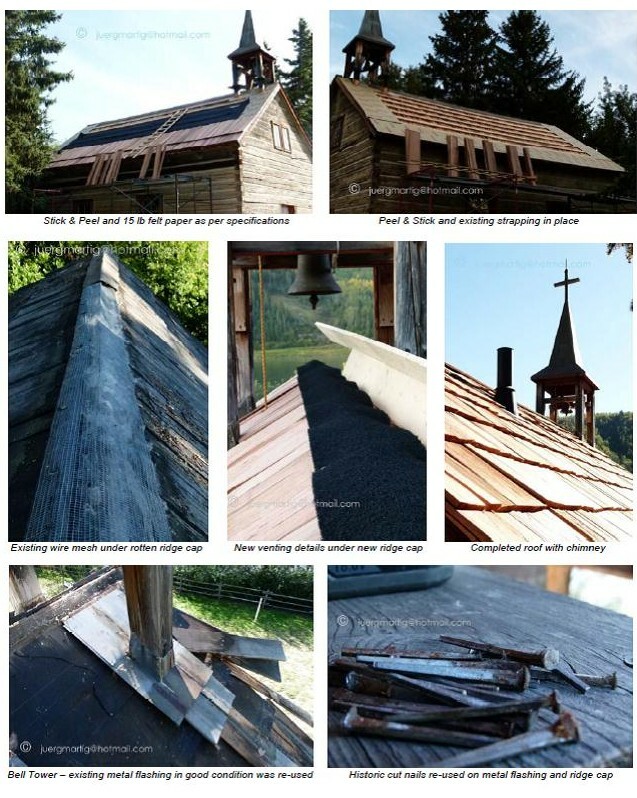 This work brought him in close contact with preservation professionals from the United States who were employing federal-level tools there, notably the U.S.’s National Register of Historic Places and the Secretary of the Interior’s Standards for the Treatment of Historic Properties. 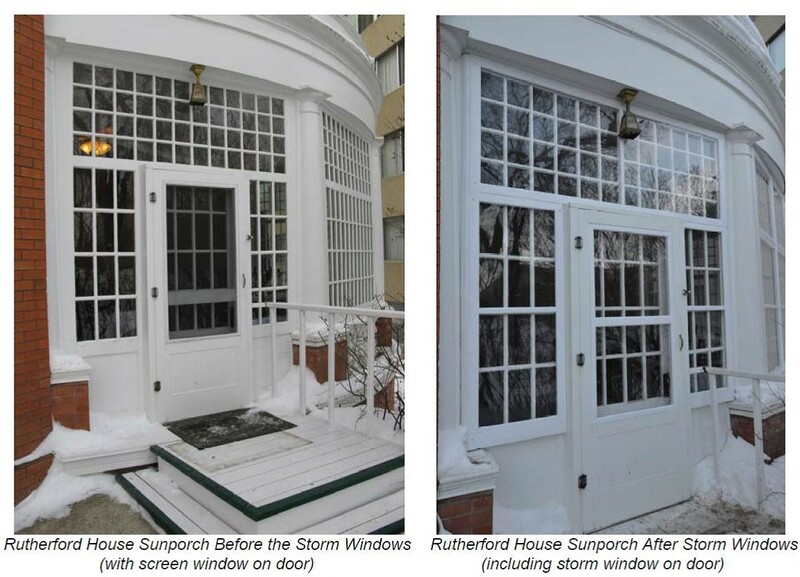 During the late 1980s, Larry led an initiative to develop a set of provincial standards and guidelines for the conservation and care of historic buildings. Alberta’s Guidelines for the Rehabilitation of Designated Historic Places, which were based on the U.S. Secretary of the Interior’s Standards, were first printed in 1990, then revised and reprinted in 1993. Then in 1999, Parks Canada began discussions with federal departments, provincial and territorial officials, and other stakeholders to develop a pan-Canadian strategy to identify and conserve Canada’s historic places. A team of representatives from provincial and territorial governments around the country worked intensively to develop a Canada-wide approach to heritage conservation. The result was the Historic Places Initiative (HPI), launched in 2001, which over the next few years established the Canadian Register of Historic Places, Standards and Guidelines for the Conservation of Historic Places in Canada, and a process for certifying that designated historic properties are conserved in accordance with the Standards and Guidelines. The HPI also provided federal funding to provinces and territories to help them implement the HPI, so that all provincial (and by extension municipal) historic places would be included. Larry helped represent Alberta during the HPI planning process. Alberta was a key contributor to developing the HPI’s Standards and Guidelines. Alberta officially adopted the Standards and Guidelines in August 2003. Colleagues in his section ensured development of the Alberta Register of Historic Places and the listing of Alberta’s historic places on the Canadian Register. Along with bringing these new guiding principles to the work of the section, which with the advent of the HPI had been renamed the Historic Places Stewardship Section, Larry also made a major organizational change: expanding the reach of the section by adding a new program area. Although municipalities had been empowered by the Historical Resources Act since 1978 to designate their own historic resources and implement protections for them, very few had chosen to do so, or even knew about this conservation tool. Larry continues: “The federal government asked the provinces to reach out to their municipalities, to ensure they were included in the work of the Historic Places Initiative. So we took a portion of the federal HPI funding and developed the Municipal Heritage Services Unit. We flowed much of the federal money through to our municipalities. It was all about building municipal capacity. Within that unit, we developed a new program called the Municipal Heritage Partnership Program to provide matching grant funding to municipalities so they could identify through surveys and inventories what’s important to them, and to help them, again through funding, to develop [municipal heritage designations] and municipal historic resource management plans…So there was a very significant, concentrated effort on engaging municipal government.” The MHPP was officially launched in 2006, although aspects of it had been piloted in previous years. “It changed our focus,” Larry says. More recently, the section’s responsibilities have grown to include the delivery of maintenance and conservation services related to historic sites and museums owned or operated by the Heritage Division, bringing further conservation expertise into the unit. The section also now provides research services in support of the interpretation programs of a number of these sites.